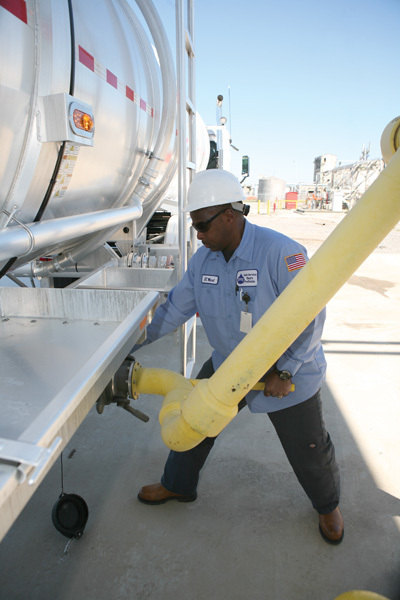 Dynamic Fuels LLC—a 50/50 joint venture of synthetic fuels company Syntroleum and food giant Tyson Foods—is now successfully converting animal fats and greases into high quality renewable fuels, including jet fuel, at its new Louisiana plant. There are some interesting things going on in renewable energy in southeast Louisiana, just down the Mississippi River from some of the biggest oil refineries in the United States. It sounds like something out of a science fiction novel, but the jet fuel for your future flights could come, in part, from byproducts of the chicken processed for your last dinner. A Louisiana company is now successfully converting animal fats and greases into high quality renewable fuels. And the company—Dynamic Fuels LLC— is getting praise for the fact that, unlike the ethanol and biodiesel industries, it does not use food ingredients such as corn and soybean oil to produce that fuel. 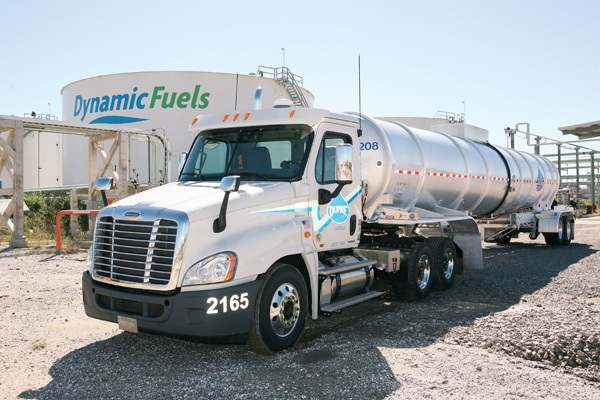 Dynamic Fuels began production last fall at 2,500 barrels of fuel per day at its Geismar, Louisiana, plant and is steadily moving toward its capacity of 5,000 barrels a day. The company is a 50/50 joint venture of synthetic fuels company Syntroleum, which provided the process technology for producing the fuel, and food giant Tyson Foods, which is responsible for the plant's feedstock. "We're very pleased with the progress at the plant and the quality of the fuel it's producing," said Bob Ames, vice president and general manager of Renewable Energy for Tyson Foods. "This fuel offers the same benefits of synthetic fuels derived from coal or natural gas, including substantial performance and environmental advantages over petroleum-based fuels." The plant is producing some of the highest quality diesel fuel in the world, and best of all, it is renewable with a carbon footprint 75 percent below that of petroleum diesel, said Gary Roth, chief executive officer of Syntroleum. "We can also make renewable, high value specialty distillate products that can be used in a wide variety of applications such as dry cleaning, ink cartridges, and drilling fluids, and we are actively pursuing these markets." The first shipments of fuel started leaving the plant last October. "There's been tremendous interest in our fuels, and so far, our customers include a range of fuel distributors and end users, including the U.S. military," said Ames. Dynamic Fuels has been making jet fuel for testing by the Air Force Research Laboratory. This is the first renewable jet fuel tested by the Air Force that has been produced in a domestic commercial scale facility. The new facility uses Syntroleum's trademarked Bio-Synfining Technology to produce the renewable fuels from non-food-grade animal fats produced or sourced by Tyson Foods, such as beef tallow, pork lard, chicken fat, and greases. The plant is designed to produce up to 75 million gallons of renewable fuels per year. Syntroleum has developed a number of synthetic fuel processes. The company owns a process for Fischer-Tropsch (FT) conversion of synthesis gas derived from biomass, coal, natural gas, and other carbon-based feedstocks into liquid hydrocarbons, the Synfining Process for upgrading FT liquid hydrocarbons into middle distillate products such as synthetic diesel and jet fuels, and the Bio-Synfining technology for converting animal fat and vegetable oil feedstocks into middle distillate products such as renewable diesel and jet fuel using inedible fats and greases as feedstock. The Syntroleum plant venture was a few years in the works, explains Jeff Bigger, director of the Dynamic Fuels, LLC Management Committee. "In 2006, Syntroleum was looking at our suite of technologies and what other applications there might be for those technologies. One of those technologies was the refining technology where we take the raw Fischer-Tropsch waxes and refine that into finished fuels—and it is an adaptation of this synthetic fuel technology that is in use at the Dynamic Fuels plant in Louisiana." At the time, there was high interest in biodiesel, and Syntroleum's engineers determined that animal fats are chemically similar to the raw FT products that they had already successfully been refining into synthetic fuel. "So we started doing some lab and pilot testing, and we confirmed that our refining technology works really well on renewable materials—and that we could make synthetic fuel, jet fuel, and diesel fuels from animal fats, oils, and greases," says Bigger. The company has determined that the process can handle feedstock from refined corn or soybean oil right down to greases. They've run more than 140 feedstocks on a trial basis, everything from algae oil to seaweed oil. Essentially, Bigger says, the process is pretty much agnostic in terms of where the fat comes from—the fat gets converted and can be turned into fuel. "Over the course of that time, I met with just about everyone in the industry who produces either a fat, oil, or grease, and talked about Syntroleum's interest in buying feedstock to build a plant. "We met with the Tyson folks, and they said they could sell us the low quality waste fats and greases from their animal processing businesses—but what they really wanted to do was be our partner, because they liked what we had developed, and that led to the formation of the 50/50 joint venture, Dynamic Fuels." Bigger notes that Syntroleum and Tyson are quite different companies, but that is a good thing. "Syntroleum has 19 employees, and Tyson has about 150,000, so we are very different in size. Syntroleum is an engineering and technology company, and Tyson is a food processing company, so there is basically zero overlap in our core competencies and our areas of expertise. "It is a very complementary relationship. Tyson brings their knowledge of feedstock, and they have a lot of logistics expertise, and a lot of knowledge on the regulations side of the business. Syntroleum is made up of engineers, chemists, scientists, and plant people. "Syntroleum is basically the technology provider, and it had a lot to do with getting the plant built and its day-to-day operations. Tyson is responsible for sourcing feedstock into the plant, and that feedstock can be either from their own facilities or from other plants." Tyson is one of the world's largest processors and marketers of chicken, beef, and pork and the second-largest food production company in the Fortune 500. Each partner has contributed their respective expertise to the Dynamic Fuels venture and plant, but Dynamic has its own staff of 45. Customers for the high quality fuel produced by Dynamic Fuels include a range of fuel distributors and end users, including the U.S. military. The company has been making jet fuel for testing by the Air Force Research Laboratory. 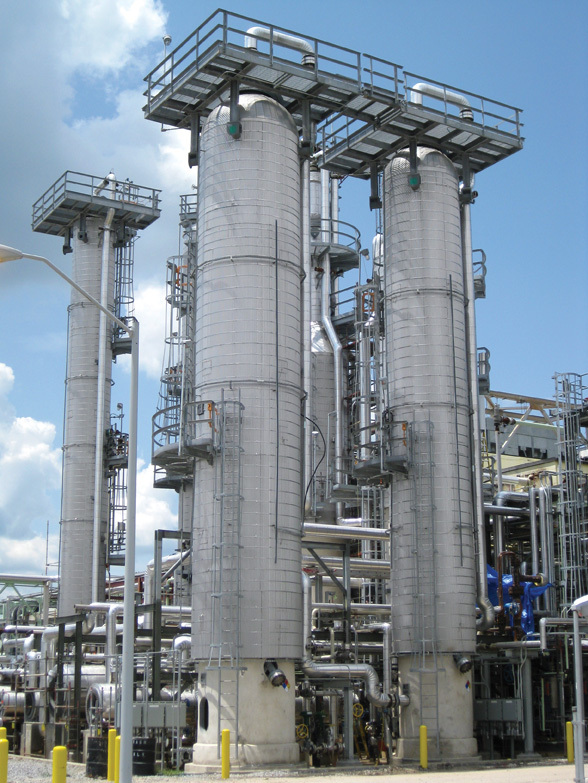 Syntroleum designed the Dynamic Fuels plant in Louisiana specifically for this type of feedstock. "There were some adaptations we had to make to our base technology," Bigger said. "One of the things about animal fats is they contain a fair amount of oxygen—10 to 12 percent—compared to raw FT products, which contain a fraction of that oxygen. As a result, there is a tremendous amount of heat release in the reactions, so the design of the reactor systems in the plant has to be completely tailored for the feedstocks involved. It's the same basic chemistry for us, but the heat release is different." He added that the process also has to be able to treat the feedstock materials at the front end to eliminate contaminants. With animal fats, these contaminants can include solid materials, such as hair and bone chips and a variety of metals, such as iron and copper. "We need to be able to treat all those materials and get them out of the feedstock before it goes into the reaction system." In essence, the Dynamic Fuels plant is not terribly different from an oil refinery operation, though its product is decidedly greener. "It's very much like traditional oil refining, with hydrocarbons processed over a catalyst. What we've done is optimize the catalyst and the processing conditions to handle the animal fat and grease feedstock to make the fuel products." There are benefits, says Bigger, to dealing with this type of feedstock. "When you convert the feedstock into a hydrocarbon, you get all the best molecules in petroleum fuels without the bad molecules. Because we are not working with crude oil, there are not all the contaminants that are present in crude oil, such as benzene, that are carcinogenic." Because it has gone through a hydroprocessing reactor, there is virtually no sulphur in the fuel—less than one part per million. All of the oxygen has also been removed, so the end product is a pure hydrocarbon. As a result, the fuel produced has a higher energy content than biodiesel by about 10 percent, meaning it packs more punch per gallon in BTUs. Not surprisingly, the Dynamic Fuels plant—involving some very specialized processing equipment—had some start-up challenges. "This is a first of a kind plant, and this plant likes to run at full rate—it doesn't like to run at partial rates," explains Bigger. "We've had to run at reduced rates when we've been dealing with mechanical problems, but as each problem comes up, we analyze the problem, implement a solution, and the reliability improves. We've been doing that for about six months, and we've made progress on the things that were holding us back. Now we're just looking to extend the reliability of the equipment and have a nice long stable run." Bigger notes that they have recently been operating at up to 120 percent of the design rate of 5,000 barrels a day. "We chose the 5,000 barrels a day rate because that's where the economy of scale curve started to deliver reasonable economics, without the plant being too large. The problem is that if you're too large, you have to go greater distances to get enough feedstock to supply that larger plant. As you go further away, the transportation costs start to become substantial." What has been the response in the market to their fuel product? "People love it," says Bigger. "It meets all the specs and is ASTM D975 diesel. And we have the ability to adjust the reactor operating conditions to change the properties. We have been making a summer grade diesel with a -10 degree cloud point, and in the winter, we will adjust that to a winter grade diesel and a -22 cloud point." The fuel has a very high cetane value. The cetane number is a measurement of the combustion quality of diesel fuel during compression ignition. So when it gets blended in with conventional diesel, it actually improves the quality of the conventional diesel. The Dynamic Fuels plant has produced fuel with cetane as high as 88, more than twice that of the ASTM petroleum diesel specification. The market for their product varies, reports Bigger. "We're finding there is a wide range of buyers in the market. Some are very interested in its characteristics and what the feedstock is. Some companies, for example, want to make sure we are not using any palm oil, because of the deforestation in the palm growing regions of the world. Others are more interested in the qualities of the fuel product." There is a great deal of interest in what would essentially be renewable jet fuel, so Dynamic Fuels has been working closely with the U.S. military "We've supplied test quantities of renewable jet fuel to the air force for testing, as well as to other engine and air frame manufacturers. When it gets certified by the ASTM as an acceptable fuel for use in jets, it will become more interesting to commercial airlines. The ASTM committee is working on the jet fuel specs right now." Tyson and Syntroleum officials remain hopeful Congress will continue the $1 per gallon renewable diesel tax credit that is currently in place. 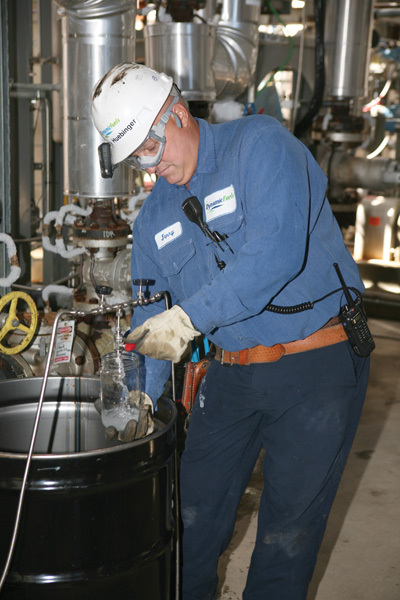 Fuel from the Geismar plant qualifies for the credit, which helps the economic feasibility of the operation and helps recover development costs. "The tax credit is good in terms of providing some certainty in terms of market values," says Bigger, "but it becomes a real problem when Congress goes back and forth—the yes, we're doing the credit, no, we're not, kind of thing. When they push uncertainty on the industry, it's bad. If the tax credit went away, I expect the value of Renewable Identification Numbers or RINs, would go up to make up for the loss of the tax credit." The Dynamic Fuels agreement between Syntroleum and Tyson calls for building more plants in the U.S. The company estimates that it is currently using only about five percent of the available animal fats and used cooking greases in the U.S. "Up until now, we've been entirely focused on getting this plant up and running, and when we've demonstrated a stable operation for a long enough period of time, then we'll focus our attention on what comes next," says Bigger. In the meantime, they are making use of what many had considered a waste product with their one plant. "We are now creating a market for lower quality fats, oils, and greases so people who have those kinds of materials are coming to us. We think this plant is going to open the door for these materials and give them a home and a market."